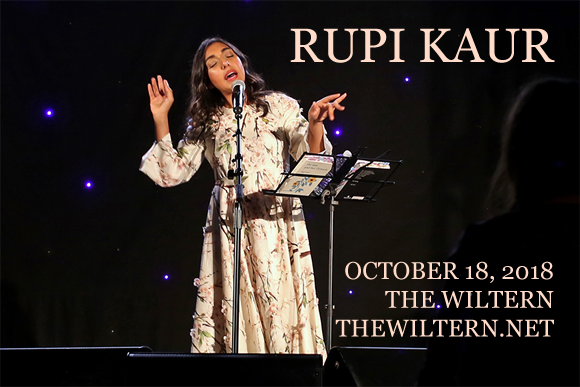 The poet laureate of the Instagram generation, Rupi Kaur, comes to The Wiltern on Thursday 18th October 2018 on her America Tour! With her unflinching, confessional, powerful and delicate prose and poetry, Kaur has become an internationally renowned voice in literature, whose work resonates with people of all walks of life. Join her for an intimate evening, as she reads from her critically acclaimed book The Sun and Her Flowers! With her feminine and concise poetry and simple illustrations, Indian born Canadian poet, writer, illustrator, and performer Rupi Kaur came to public attention in 2014 via her Instagram account, which drew global interest and over one million followers very quickly. Milk and Honey, her debut poetry anthology, was released in November of that year, and is an accumulation of poetry, prose and illustrations drawn by hand. Kaur chooses to present her poetry in exclusively lowercase writing, using only the period and no other forms of punctuation. This is in the tradition of Gurmukhi script and is a deliberate honoring of Kaur's culture. Milk and Honey was well received, and has since been translated into 25 languages. It appeared on the New York Times Best Seller list for over 77 weeks. The Sun and Her Flowers, Kaur's second book, was released on October 3, 2017 and ranked in the top ten of both the Amazon and New York Times Best Sellers lists.